The Parish and Family Life Committee provides for a holistic growth and development of the parish family. It is to promote Christian community and personal development and, in a practical way, to enrich family living within the parish community. The Committee's concern includes all age groups and their varied needs. Its goals and objectives should be prepared in conjunction with the pastoral plan prepared by the pastor and the pastoral council. · Assessing the needs of, and recommending programs for, various groups in the parish. · Working in coordination with various diocesan offices, to develop or to improve existing programs with the parish. · Providing for periodic updating of the parish census through the office staff and ministers. 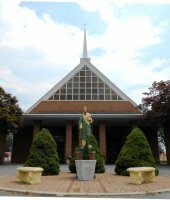 · Develop and coordinate a good parish social life program. This program is based on promoting values of the parish family and our Catholic faith. · Develop and maintaining the Parish website. · Guiding the community in reaching out and welcoming new members. · Providing a faith based support system for those in need. · Fostering a spirit of prayer and concern in the community for one another. If you need someone to pray for you or your loved ones, please send in your requests for we consider it an honor and a privilege to pray for you. The Prayer Line Ministry is a 24-hour, 7-day-a-week intercessory prayer. When you call, a person will answer the phone, receive your prayer request, and pray with you. The Social Committee's goal is to develop and coordinate a good parish social life program. This ministry is based on promoting the values of the parish family and our Catholic faith. We personally welcome each new parishioner by mail to attend a special reception after Mass where the committee provides important parish information, and extends an invitation to new families to participate in and join one or more of the parish ministries and/or committees. Local area information is also included to help provide an easy transition to our parish and the surrounding community.